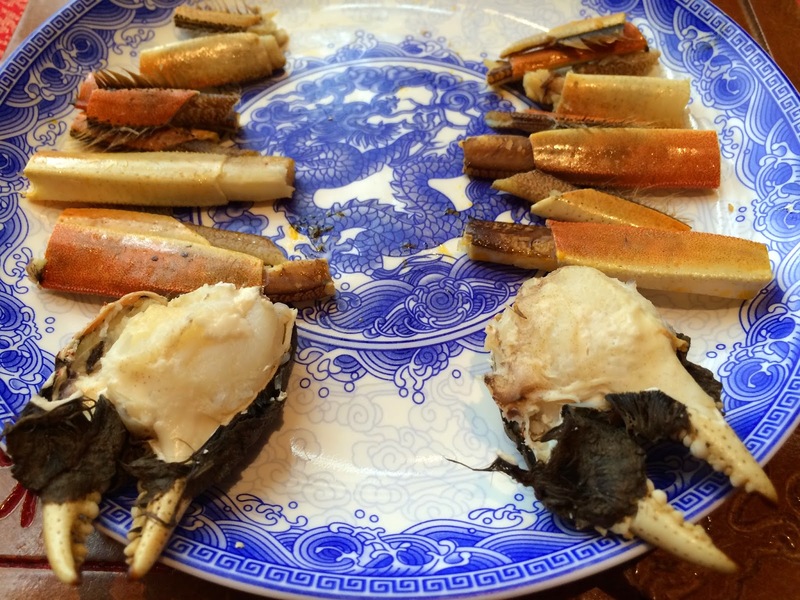 The Hairy Crab season is undeniably the highlight of the autumn calendar. 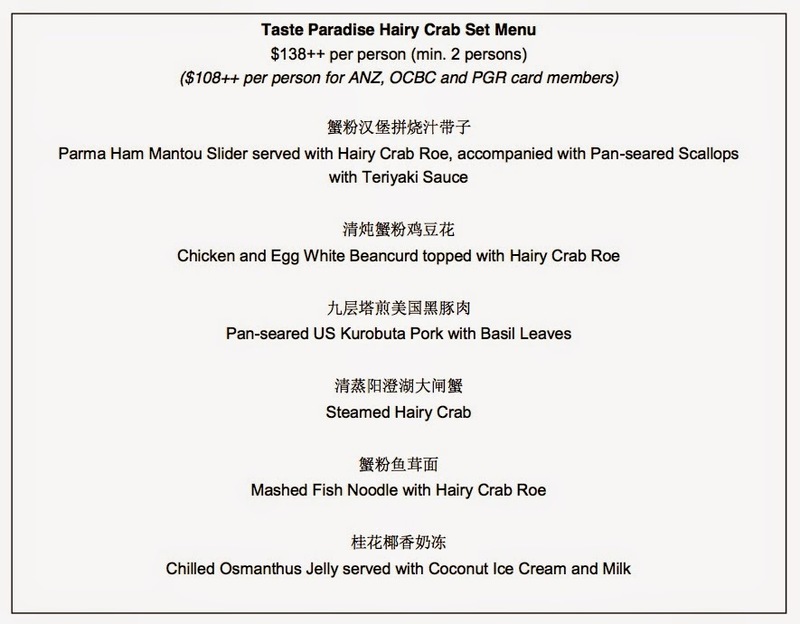 You can indulge in the finest harvest of hairy crab at Taste Paradise and Paradise Pavilion. 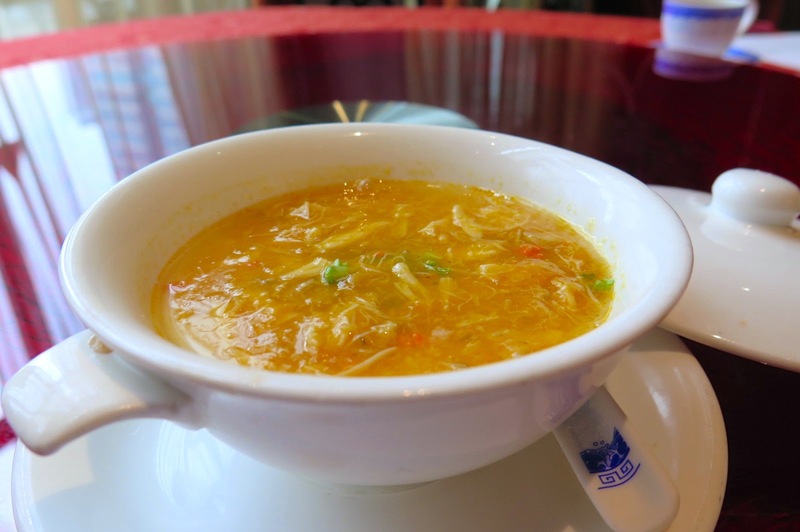 This seasonal autumn delicacy from the famous Yangcheng Lake 阳澄湖 is available for a limited period only from 1 October to 30 November 2014 at both Taste Paradise and Paradise Pavilion restaurants. 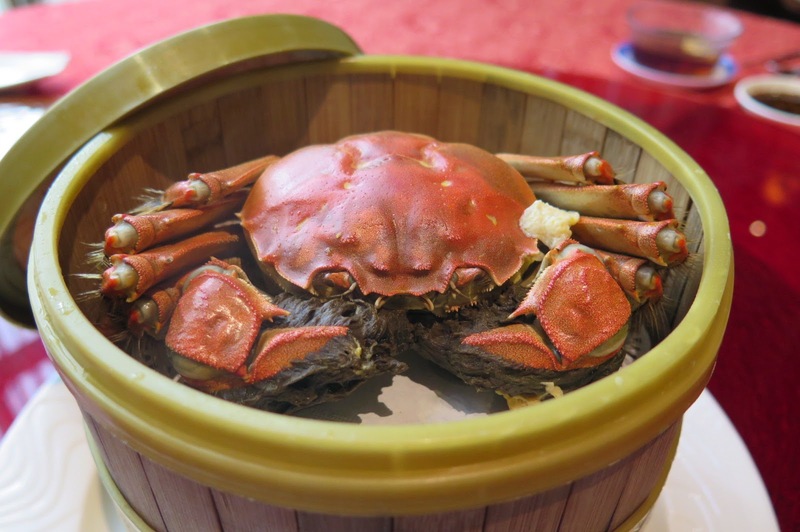 The crabs produced in Yangcheng Lake have long enjoyed great reputation abroad, and touted as “The King Of The Crabs” thanks to its special appearance and the natural ecological environment. 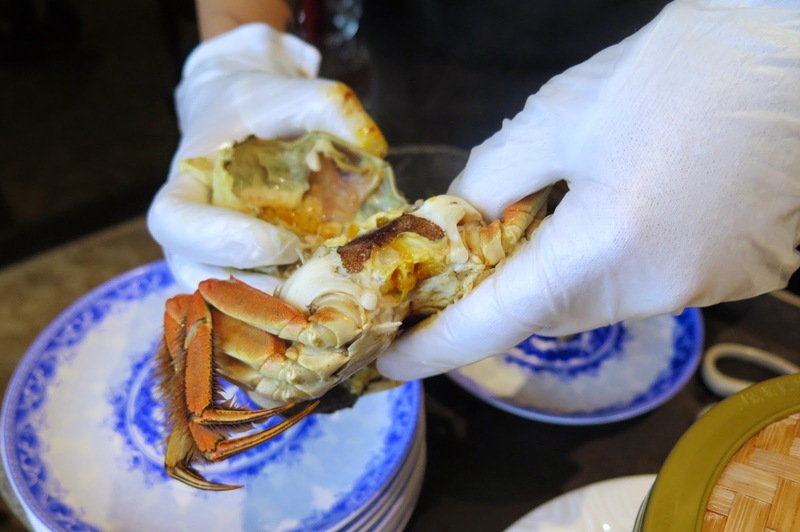 The Chinese mitten crabs better known as Da Zha Xie (大闸蟹) have strong characteristics that distinguish themselves from the other crabs in the region. These aquatic produce boast sweeter meat, as well as rich and succulent roe. If you have not got your claws on the hair crab, this is a great opportunity for you to enjoy the exquisite taste of this gorgeous delicacy. You probably have to wait for another 10 months if you missed it this time. There are a variety of methods to cook the hairy crab. For the best tasting crab, have it steamed as this classic method preserves the original taste succulence of the crab without compromising its natural flavours. When confronted with one of the little beasties on your plate, how exactly do you tackle it? 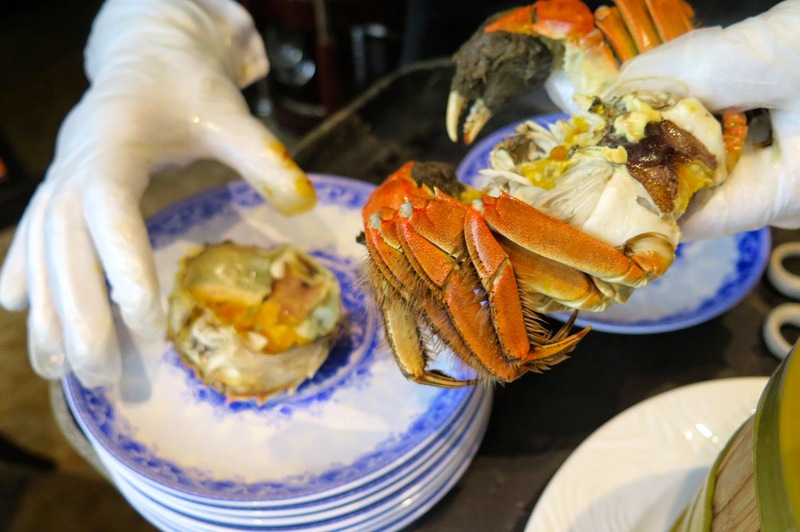 You can choose to tear the crab apart with your bare hands, or leave it to the skilled waitstaff to dismantle it for you. Since I don’t want to get my hands too busy and dirty, I’d chose the latter for sure. Hairy crabs can be intimidating if you do not know how to eat them, but a lot of fun if you do. The first step of eating a crab is always visual. I stared at the crab momentarily, before the waitstaff demonstrated her artwork of tearing the crab apart. Awed by the relish demonstration, I took delight in taking pictures of the little beast’s shell been pried open and its body and legs been snipped, and finally the fun begins. Now it’s time to roll up the sleeves and enjoy these prized delicacies. After the apron and the top shell of the crab is removed, this is the favourite part where you spoon out the bright orange roe inside. Next, the crab legs are pulled off. Eat the exposed flesh and get at the meat inside the shell. Lastly, finish it off with the remaining segments of the crab, the claws and the pincers. The moist chunks of meat in the claw and pinchers are easily devoured with minimum poking and digging. 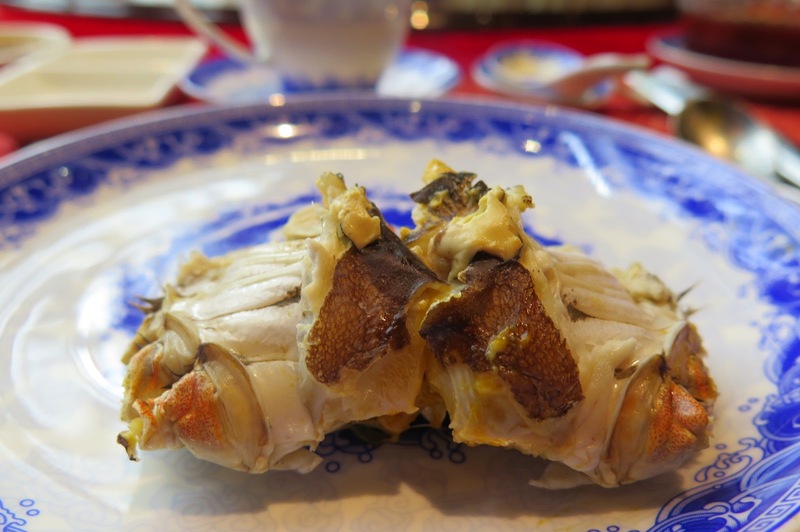 Delectable hairy crab dishes can cost up to $100 if purchased individually. Taste Paradise and Paradise Pavilion present this highly sought-after delicacy in ala carte and set menu options. The well established Chinese restaurant Taste Paradise offers a six-course hairy crab set menus that is priced at $138++ per person. The Hair Crab Indulgence menus are specially curated by the Paradise team of stellar chefs, using an array of unique recipes and ingredients with different culinary cooking methods to showcase the crab to its best. Here are highlights of some of the exquisite crab dishes available at Taste Paradise for lunch and dinner. To tease the palate before the main feast, chef created the Parma Ham Mantou Slider served with Hairy Crab Roe, accompanied with Pan-seared Scallops with Teriyaki Sauce where the hairy crab roe are placed atop crisp-fried mantou sliders and accompanied with succulent scallops that are pan-seared to perfection. 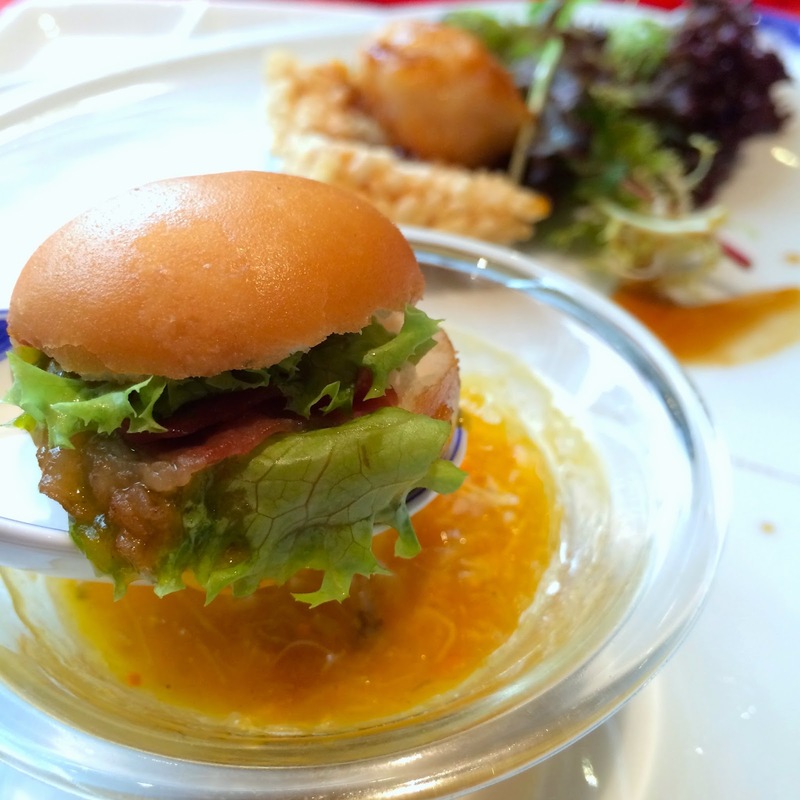 Part Highlight of Taste Paradise Hairy Crab Set Menu – Parma Ham Mantou Slider served with Hairy Crab Roe, accompanied with Pan-seared Scallops with Teriyaki Sauce. 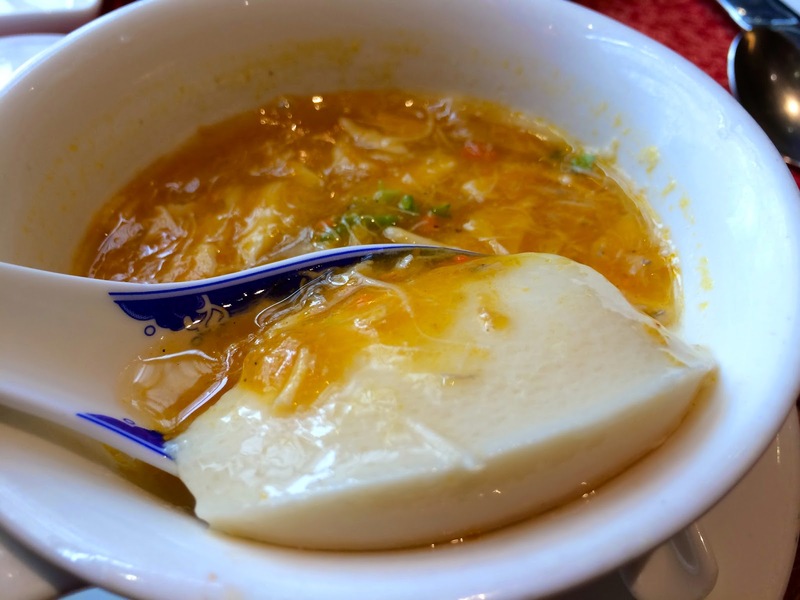 The Chicken and Egg White Beancurd topped with Hairy Crab Roe is a dish which demostrates a perfect example of a traditional dish further heightened with a new ingredient where the essence of the latter is beautifully blended with the flavours and cleverly accentuated. Part Highlight of Taste Paradise Hairy Crab Set Menu – Chicken and Egg White Beancurd topped with Hairy Crab Roe. 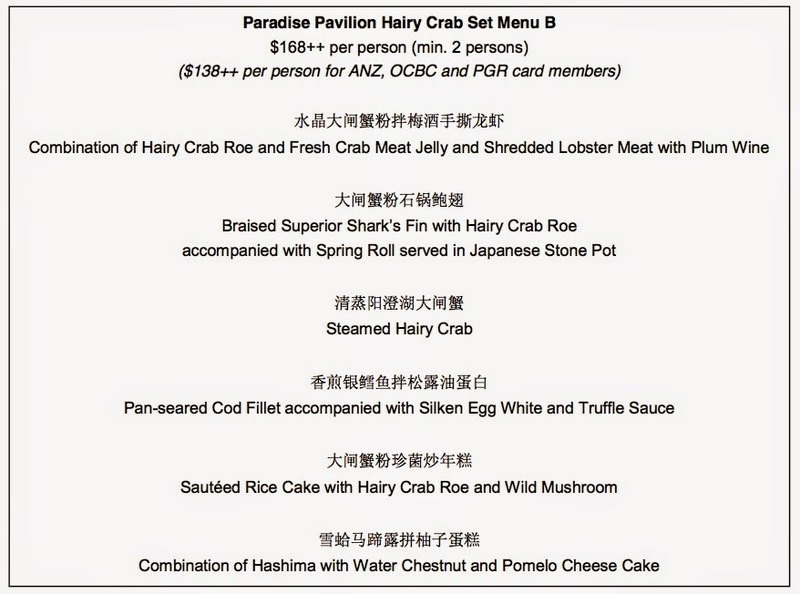 Debit/Credit Cardholders for ANZ, OCBC and Passion Group Royalty members, can further enjoy the hairy crab set menu at a special discounted price $108++ (Taste Paradise). 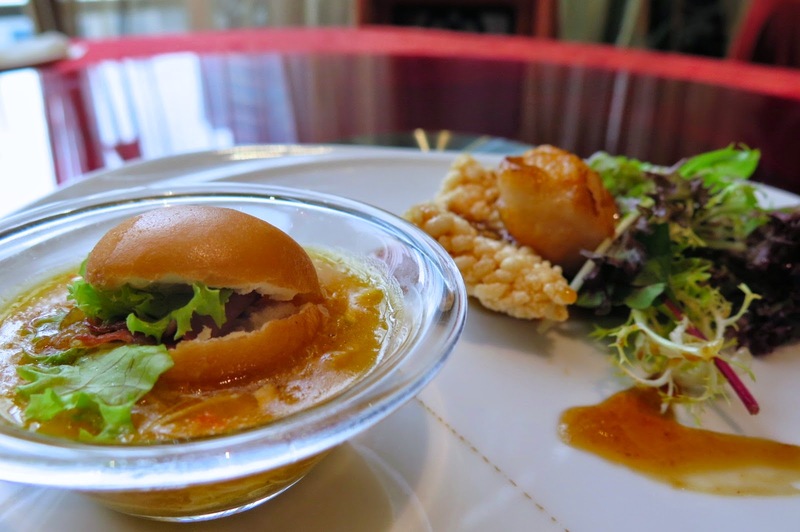 To enhance the gourmet dining experience, customers at Paradise Pavilion can enjoy the heavenly hairy crab or delight in the roe served with shark’s fin as an ultimate indulgence. Priced at $128++ (Menu A) and $168++ (Menu B), the six-course set menu at Paradise Pavilion features the hairy treasure and scrumptious signature creations such as the luxurious Braised Shark’s Fin Soup with Hairy Crab Roe in Brown Sauce Served in Winter Melon, or Pan-Seared Cod Fillet accompanied with Silken Egg White and Truffle sauce. Here are highlights of some of the exquisite crab dishes available at Paradise Pavilion for lunch and dinner. Part Highlight of Paradise Pavilion Hairy Crab Set (Menu B) – Combination of Hairy Crab Roe and Fresh Crab Meat Jelly and Shredded Lobster Meat with Plum Wine. Jellies are absolutely the way to go as a dessert and combining the gelatine with fresh crab meat is a good way to promote the lusciously sweet and delicate meat. This is not served as a dessert but a palate teaser before the main feast. Part Highlight of Paradise Pavilion Hairy Crab Set (Menu B) – Braised Superior Shark’s Fin with Hairy Crab Roe accompanied with Spring Roll served in Japanese Stone Pot. 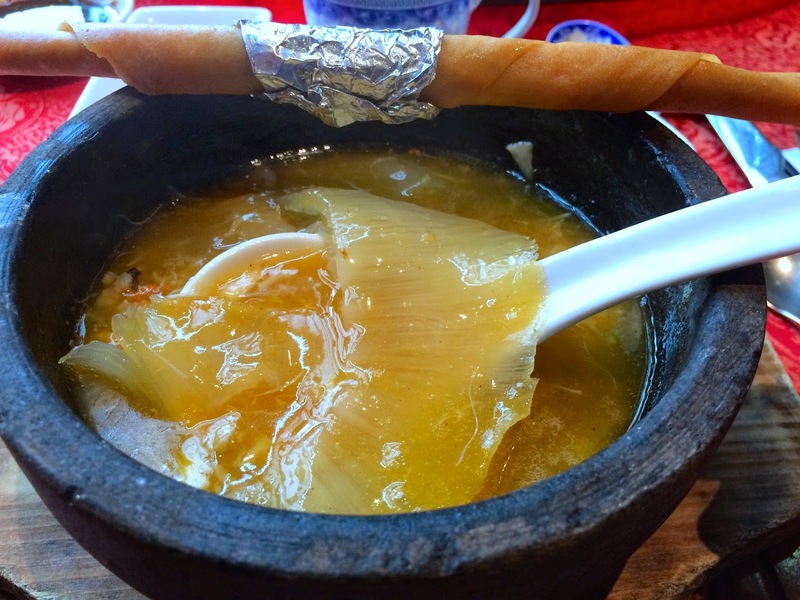 The braised shark’s fin soup was served in a hot stone bowl, which keeps the broth heated throughout the meal. The broth was rich in flavour and enjoyable, the portion was extremely generous I am not complaining at all. 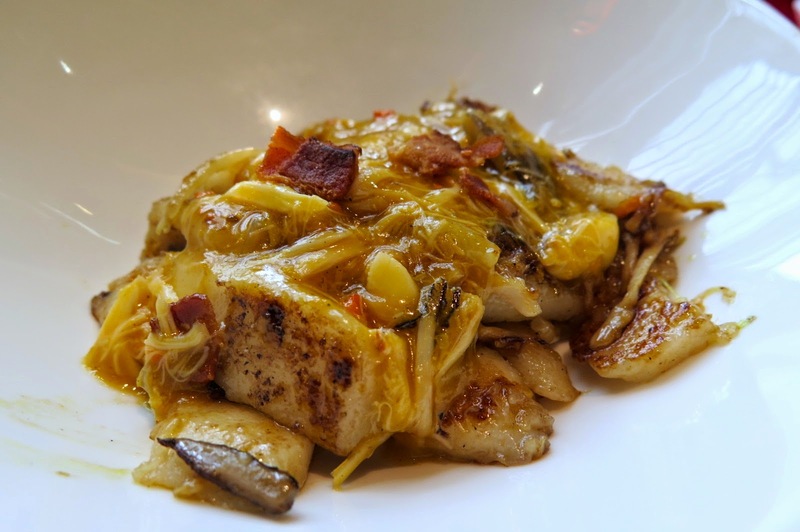 Part Highlight of Paradise Pavilion Hairy Crab Set (Menu B) – Sautéed Rice Cake with Hairy Crab Roe and Wild Mushroom. 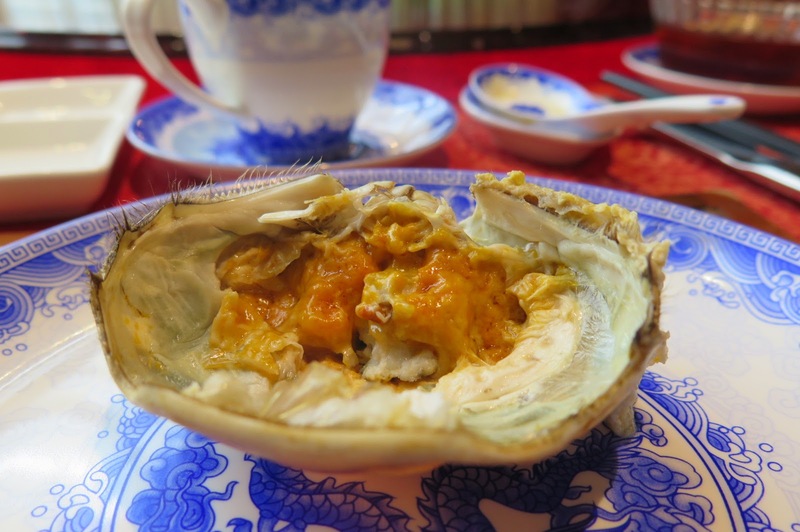 The combination of rice cake with hairy crab roe and mushrooms delivers an irresistible taste. With the richness of the crab roe topping and the alluring smoky flavour of “wok hei” this dish will surely whet your taste buds. 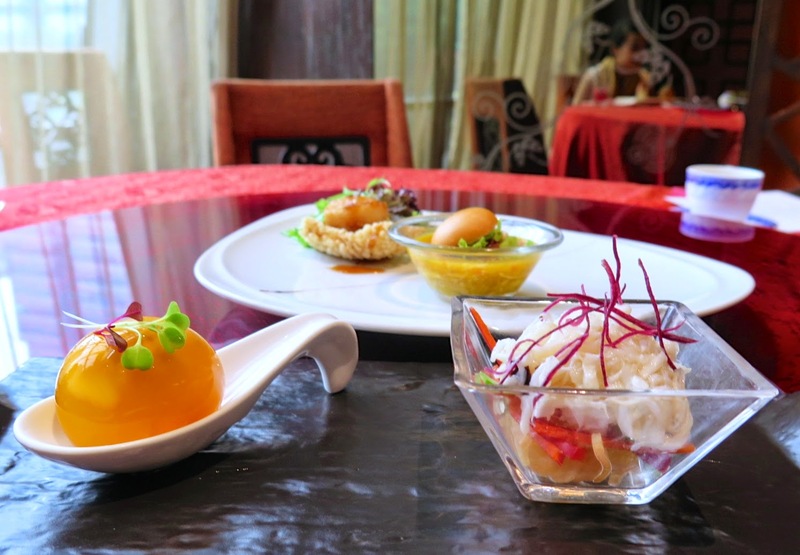 Complete the dining experience with a typically sweet course. 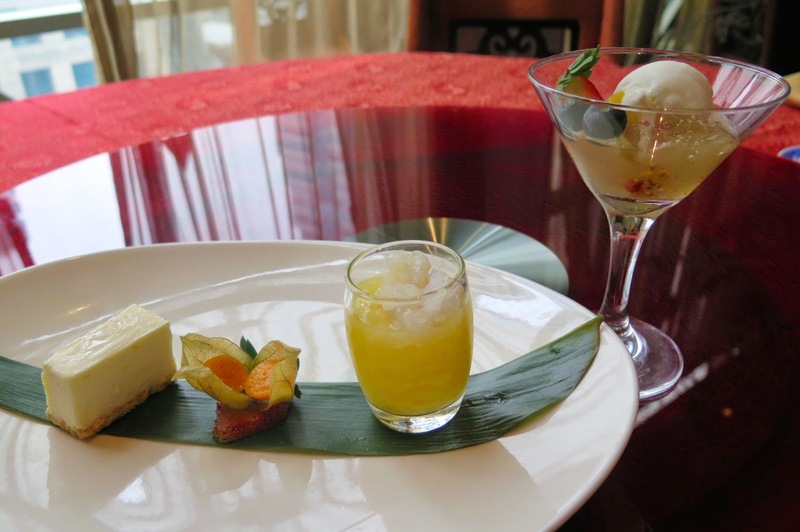 First up on the left side of the picture, is Pomelo cheese cake and Hashima with water chestnut, available at Paradise Pavilion Hairy Crab Set Menu. The dessert glass on the right side of the picture, is Chilled Osmanthus Jelly served with Coconut Ice Cream and Milk, available at Taste Paradise Hairy Crab Set Menu. My top dessert pick goes out to the luscious Pomelo cheese cake which has the right amount of sweetness. When I tried the Pomelo cheesecake with the very first bite, I have been fallen in love with it. The velvety smooth, creamy, texture makes this kind of cheesecake stand out the crowd. The cheesecake is not too sweet, yet just enough to entertain your sweet tooth if you have one. How I wish the pomelo cheesecake is on the ala carte menu, I would definitely order an extra serving for it! 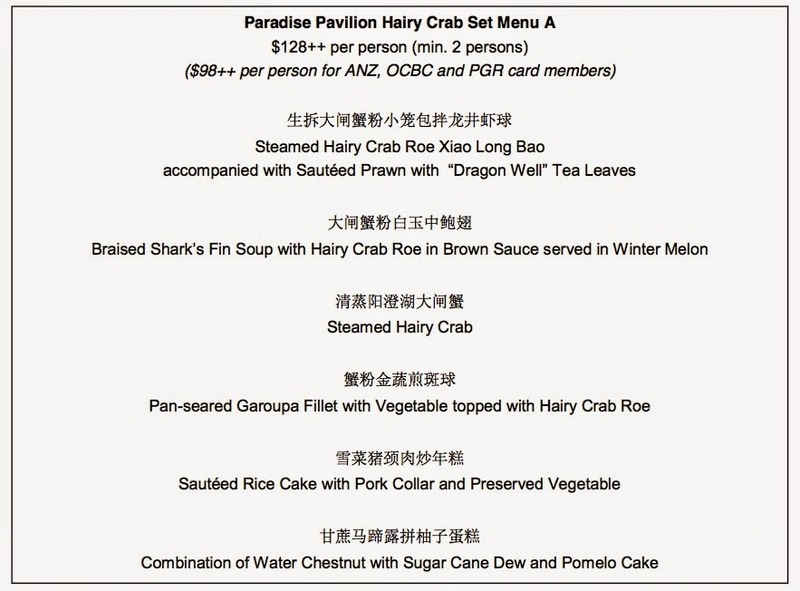 Debit/Credit Cardholders for ANZ, OCBC and Passion Group Royalty members, can further enjoy the hairy crab set menu at a special discounted price $98++ (Menu A) or $138++ (Menu B) at Paradise Pavilion. Partake in this annual indulgence and catch these hairy crab promotions before the end of November. Be sure to make a reservation at Taste Paradise or Paradise Pavilion if you wish to savour the crab dishes, as the restaurant limit their imports daily to ensure that they bring you the freshest produce ever.